The whirlwind of summer fun has calmed down, and what we have now is the seemingly quiet stillness of fall. I’m all for cozying up on the couch with blankets and tea, but it is also very easy to get sad and depressed during the fall months. Just look out the window…more often than not, you see grey skies and wind and rain. In attempts to avoid seasonal fall blues, we set out to create a little Fall Bucket List. One day, we sat down with my kids and asked them what things they look forward to the most in the fall. We wrote them all down and made a bunch of paper leaves in beautiful fall colors. Then we hung them up where the summer bucket list had been hanging just a few short weeks ago. This little visual helps us to see the potential in the fall and celebrate its beauty. If you would like to create your own, it should only take you about an hour or so. 1.Find free tree leaves templates on the web. I found a whole bunch of free clip art images here and here. 3.Using a pencil/marker and your color cardstock (or construction paper), trace the leaves. This is where kids’ help is the most welcome! I then layered a few leaves of different colors together to create a bit of dimension and contrast. This step is optional, but it does add a little sophistication. 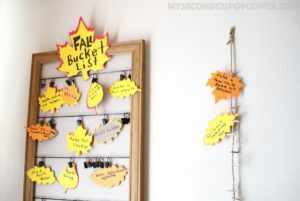 5.Write your fall activities on the leaves. 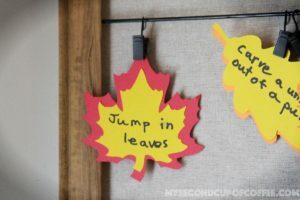 If your kids are old enough to write, have them write down the fall activities on the leaves. I love the imperfections and little smudges. It looks real and absolutely adorable! Try to give more freedom and space to your kids when they craft instead of striving for perfection. They will gain confidence in their skills and learn to be independently creative! We already owned a simple frame with hooks to display photos I picked up from Target last year. We attached our leaves to the hooks on the frame. If you don’t own anything similar, don’t despair! You can take twine and hang it on the wall in the zigzag manner. Or take a large embroidery hoop and wrap the twine around it and then hang it on the wall with the leaves attached to the twine. You also can simply hang a twine or ribbon from side to side and attach your leaves as a garland. I’m sure it’ll look beautiful. Another idea is to print out a picture of a tree and attach leaves to it by rolling a scotch tape in a circle. 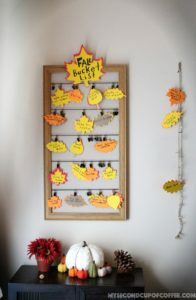 Every time you do a fun fall activity from your list, take the leaf down and put it in a little bucket, basket, or a jar. We attached a string of twine to the wall with a pushpin right next to the frame with our leaves. And every time we do something fun, we take it off the frame and attach that leaf to the string. We cut out a couple of very large maple leaves and glued them together. 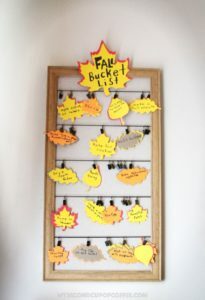 My daughter wrote “Fall Bucket List” in big letters with a sharpie, and then we stuck it to the top of our frame. We used the old trick when you roll a piece of Scotch tape in a circle to make a faux double sided tape effect. So that it’s easy to come off and it won’t leave a glue mark on the wood. And there you have it! 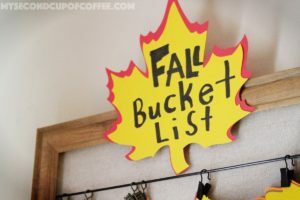 A simple, fun, and colorful Fall Bucket List for your family! 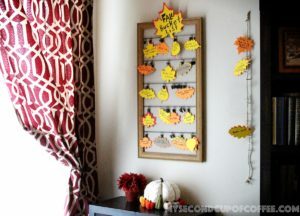 If you have kids who love crafting, they will definitely enjoy doing this little project with you. I love including my kids, especially my daughter, into the process of making family projects. Not only is it a creative outlet for the little hands, but it also gives your kids a sense of ownership of the project. 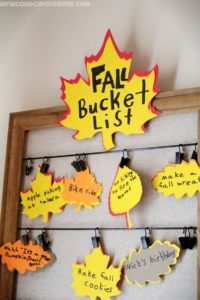 They will more likely to look at your Fall Bucket List and be excited about doing the fall stuff when they see that beauty they created! Happy Fall and Happy Crafting!